BioBag® Doggie 50- Dog Waste Bags are accredited with being the first biodegradable and compostable non-polyethylene pooper-scooper bag in the world. It is one of our most popular products. Designed for the collection of kitchen food scraps and other biodegradable waste for composting. Kitchen food waste makes great compost! 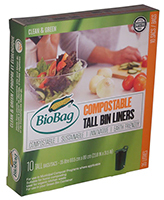 BioBags take the mess out of food waste collection, keeping your compost pail odour-free. 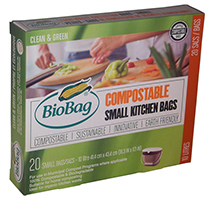 When disposed, Ecolife BioBag brand bags will biodegrade as naturally as the food scraps, leaving no harmful residue. Certified compostable, certified biodegradable. Designed for the collection of kitchen food scraps and other organic and biodegradable waste for composting. The MaxAir Kitchen Bin is an advanced home composting system that allows you to dispose of food scraps in your kitchen. The ventilating design of the MaxAir kitchen composter keeps air flowing through the bin and liner to prevent bacteria growth, odours and fruit flies. Over 3 million MaxAir's Sold!